We have outdoor wood and gas burning firepits and fireplaces. If you are custom building your own firepit, we have the burners, valves and other equipment to help. Firegear has everything you need to custom build your firepit. 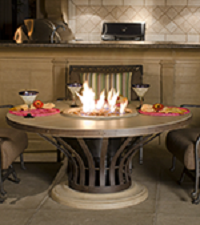 American Fyre Designs offers fireplaces, firepits, fire tables, firewalls and much more. Dimensions: 28" x 32" x 46"